Release Fear & Embrace Love. Release Fear with Archangel Michael's Help! You live in a world of opposites…. A world of duality, you may say. There is hot and cold; on and off; connected and disconnected…. Love and fear. Spiritually, you essentially have two options about how you can react in every moment in your life. One option aligns you with the one energy that powers everything, and connects all that is. The other option brings you a little further away from your source of spiritual power. Which are you choosing more often? 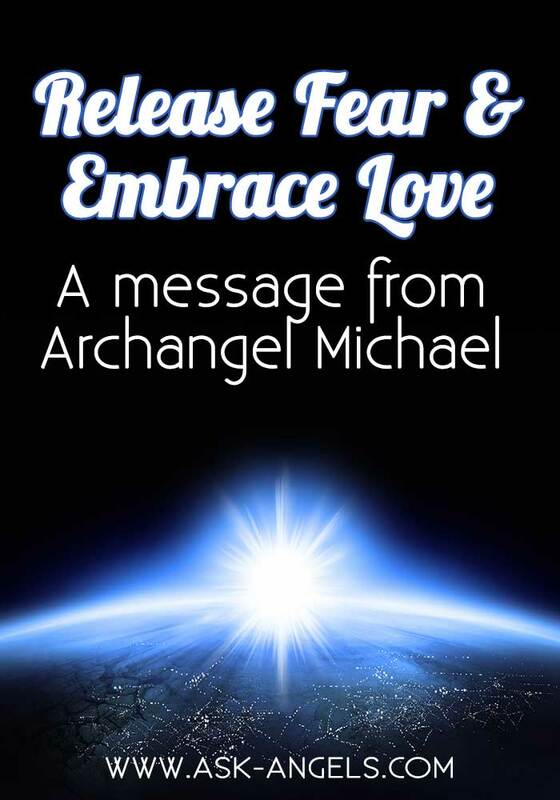 This new channeled message with Archangel Michael is both uplifting and enlightening. You will understand how awareness can propel you forward towards the highest potential of your life. You have entered into a new paradigm in which the love you integrate into your being is able to manifest as tangible blessings into your reality. It is your love and gratitude as these blessings manifest that will assure the blessings will continue to appear in your life. Your angels are here to help you increase your awareness and to help you release conscious and subconscious fears and replace them with love. You are supported now in leaving behind past challenges or even blessings which no longer serve and to step into a positive new beginning. This new channeled angel message is mixed down with the music channeled by Thaddeus and will help you continue your awakening process as you continue to build your spiritual light. Please right click the below link and save the message to your computer, or ctrl+click if you are on a mac. Beloved one, indeed, know that I, Archangel Michael, am here though I greet you with many beings of light and masters from the inner plains. We greet you with joy, compassion, and frequency. Know that as you open your heart and enter in, you are able to retain your awareness. Awareness that comes not from your logical mind, but awareness that comes from your conscious being. Awareness is of paramount importance in your continued evolution and growth this year. Awareness is largely responsible for what you do and do not create and, what you do and do not draw in to your experience. As you increase your awareness, with this increase comes increased ability to create blessings in your life, to know your path, to love all beings. For with increased awareness you are able to be aware of all the many blessings that are present in your life, and with this awareness, and with the perspective of love and gratitude, give thanks and rejoice, for all that is going right in your world, in the world. Gratitude for all that you appreciate, for all that you enjoy, and this awareness, of course, combined with your thoughts and with your emotions and with your beliefs in every moment ripples outward, actually weaves the intricate web of life. And so as you increase your awareness, look for more things to be grateful for. Use your skill of being aware to find the blessings in your life and in the lives of others, for when you love what is yours, what is your neighbor’s, what is your enemies, when you love and rejoice at the successes of others and the small and large successes in your own life, you infuse your energy signature with love, with gratitude, and with compassion. We have said before and say to you now, these are the forces of the universe, of the multiverse, that move you forward on your path, in your life, towards reaching your goals and accomplishing your purpose. Allow yourself to relax now as we angels lower down an orb of light and blessings around you. Know that as this orb of divine light encompasses your aura, it serves to magnetize and pull out, draw out into the open that which has been suppressed and buried within you; those grievances and fears and doubts that have been hidden beneath the surface, but now come to the surface and rise into the light so that you may be aware of those aspects of yourself that you are holding onto that do not ultimately serve. However, this resistance in the energetic world where everything is connected from our perspective in the angelic realm, this resistance magnetizes more of what you are resisting. For the saying dating back in time is true; where your attention goes your energy flows. There is a natural process of the old melting away as you reach new heights of spiritual connection within yourself. When you align with your path and anchor more of your spiritual, authentic self into the physical, this aligns many blessings, and aligns many miracles as your gifts begin to blossom, as synchronicity begins to flow, and as you attract to you that which you need. On the other side of the coin, as you evolve and change so too will some aspects of your reality and your relationships melt away. This is a normal process, however, your reaction to that which no longer serves leaving, determines what will come next. Will more fall away in a shocking or turbulent way? Or are you able to accept that whatever falls away from your life is ultimately a blessing? As you are able to see the blessings in all of your challenges and give thanks for what they seek to align for you, you are able to ensure that the old melts away in a graceful and peaceful way. Then new blessings can enter in efficiently and plentifully. It is when you resist the old falling away, it is when you dwell upon the struggles and the arguments and the tension from the old falling away that you attract more of this unto you. Plant the seed of intention into your consciousness; “I learn my life’s lessons gently and easily. I move towards the light and my ultimate purpose with grace and love, and what no longer serves me effortlessly fades away.” Understand that your increased awareness, is something you must claim for yourself. There is not another who can give you increased awareness. However, you do have the ability to claim this for yourself and it is something you must do in every moment. You must return to awareness time and time again. Let increased awareness become your practice so that you naturally are aware. Practice seeing your reality through eyes of love in every moment. Practice quieting your mind, opening your heart, feeling, sensing, knowing, understanding, and being aware that all that happens in your life, indeed, serves to propel you forward. Forward on your path of becoming the full integrated light master present in physical form. You see, this learning and growth, ascension and forward movement is your highest purpose, and the highest potential for your life. This did not melt away when 2012 came and left, rather you have entered into a new period, a new paradigm, in which the love you integrate into your being is able to manifest as tangible blessings in your reality more quickly than ever before. And it is your love and your gratitude as these blessings manifest that ensure more will follow. When there is a friend who no longer resonates with your vibration and it seems the relationship is fading away, do not grieve or mourn for the loss. Do not fret, do not sorrow, for this will attract more of what you have just experienced. Rather, when something from your life shows that it is beginning to fade away, rejoice, love, be aware of all the blessings that this person or situation or job or mode of being has brought into your experience. Give thanks for what has been, for what you did appreciate about this relationship in the past, for what you do appreciate about this scenario now. For with this awareness and with this perspective, the old and the outdated may still fall away, but do not mourn for the loss. Rather, rejoice what has been. See the blessings that this scenario or relationship has aligned for you and then be willing to let it go. For the practice of non attachment is the path to resolve suffering. You are not meant to suffer when aspects, people, places, and situations in your reality fall away.Appreciate and notice and be aware of the ways your life has been enriched. Where has this person or situation brought blessings into your being? Honor these moments. Shine your light of awareness upon these, upon that which you have to be grateful for. Your lesson in this is to love and give thanks, and to be grateful for that which has been, to send love to the person who is moving forward and to infuse yourself with love as you move forward in a new direction, knowing that you have been enriched by what is, and these blessings cannot be taken away from you even as the outdated situation does fall away. Rather, you carry what you have learned, you carry the insights, and the lessons, whether direct or in reverse, forward with you on your path, in your journey through life. This is why awareness ultimately serves you for even in the most turbulent of times, the most challenging of situations, the most sorrowful of events, you are able to recognize and love. You are able to see the silver lining, you are able to know the hidden blessing and, yes, at first you may have to search and probe to see some sort of positive outcome. You may have to search your inner realm to see an ounce of grace and love, but focus upon this love and where your energy is focused, where your awareness is present, light, and love will build and grow. Know that which falls away from your life does so not to cause you undue hardship or tribulation. It does so to align you with something new. And so as you increase your light, as you bring more compassion and gratitude and well being into your experience, part of the blessing is that you will begin to create new things to be thankful for, new modes of being, new relationships, new situations through your love, gratitude and awareness. When you are able to celebrate the small victories of others, celebrate the successes of others, you are saying yes to the universe and to the process of creation. You are saying yes to success even when you celebrate the success of someone and that which is not directly your own. Celebration draws more of this likened vibration into your experience. You lift, you evolve, and from your new vantage point as you love and appreciate all that comes into your awareness, you can ensure that you are attracting more of what you love and appreciate to you. It is likened somewhat to creating a catalog from the catalog of life; saying yes, flowing your love, flowing your gratitude and your appreciation to all that you see that you desire in your life and in the lives of others. When you are able to say yes and to celebrate and rejoice over these items, over qualities, characteristics, over feelings that are yours and that belong to others, you draw them to you. Your life improves, you reach a new level of light. Then at this next level of being, there may be new areas of your life that begin to crumble and begin to fade away. You vote in every moment with your energy and how you respond. We say to you, choose love in every moment not because it makes us happy, though it does. We say this because love is your direct path to aligning with the full blessings that are meant for you in your life. And so as the old fades away, do not mourn. Smile at what has been, for it is rather impossible to smile and to stay in a mode of negative manifestation. And so simply forcing a smile upon yourself can be enough to shift your thinking, to bring yourself back into the perspective of being aware, of all the many blessings that are around you including the many blessings that have come about and those that are beginning to fade away. Honor what has been, honor what is now, and trust that as something leaves your life it does so to make room for something new, for something new to be birthed into your experience. And what will be birthed is largely determined by you. You have a destiny, you have a divine path, yes there is a plan for your life. However, this plan is likened to the books where you choose your own adventure. For, you see, in every moment you have a choice to head towards love or to move towards fear. In every moment you have a choice to turn the page or to stay where you are. You are choosing your own adventure, you are painting your life, you are creating your story in every moment and so now as you step back, as you look down upon yourself from above, as you step into the perspective of an observer, into perceiving reality from the part of you that is always connected to the divine. As you step back and observe your life as it is in this very moment, notice new attributes, notice new scenarios, notice new things in your experience that you have not yet given gratitude for, that you have not yet declared, “I love this” or in other words “ I want more of this.” Find something, even if it is small. Waking up to sunshine, viewing the stars at night, a kind word from a friend, a smile shared upon coworkers. What blessings have you not appreciated? Know that your appreciation is the link, your gratitude is what links what you have had and enjoyed in your life thus far, with actually bringing in more blessings of abundance, joy, love, and prosperity. And so awareness is essential. You must be aware in order to find the subtle, intricate blessings in your life. You must be aware to see the silver lining in a challenging situation. Quiet your mind, open your heart, enter in, and from this place observe, from this place notice what is going right and notice what is going wrong in your reality and with what is going wrong find the blessing, find the silver lining, find the ways the situation has helped you up until this point even if it is now meant to fall away. When you can find the blessings that have been you ensure that more blessings will come about in your experience. It is when you dwell on the struggle, dwell on everything that has gone wrong, dwell on what has been and all the things you did not like about it, or how much you will miss it that your energy signature votes for more of the same, votes for more negative energy exchanges, and more struggle. Right now notice, be aware of your past struggles, of past density and challenge. Feel it, look it in the eye, be aware, and now release this past density still held within you into the light. Your team of guides and angels also enter in to wrap this negative mode, this negative lens, these past challenges brought about from this paradigm of duality. Let them go, let them release into the light. And now unique to you, refocus upon something you are grateful for. Re focus upon something that is beneficial, something that does make you smile, that does encourage you to radiate, to shine as the full light being that you are. Focus upon the love and the successes and the blessings, to draw more of them unto you. And when things turn challenging, know that sometimes it is OK to let them go. It is OK to let the outdated melt away. But as things leave your life, give thanks for what has been. Stay in an attitude of gratitude and recognize the many blessings that the situation or person has brought unto your being, and this perspective will help you to move forward, will help the other to move forward, will help the universe to rearrange itself, to bring more to be grateful for into this paradigm and into this realm and into your life and your being. It is ultimately within your control, dear conscious creator, and so release blaming others, release blaming the past. Know that you are responsible and in this moment and in every moment, your awareness will carry you forward into letting your full light shine, into letting your full authentic self be present here in physical form. The new earth is only beginning. The world was never meant to end on a certain day or date, rather, a turning point brought about by you and all those whom you have touched choosing to love. Choosing to love in times of joy, choosing to love in times of sorrow, choosing to be fully aware of all the many reasons to be grateful and choosing to love amidst whatever is going on around you. As you embrace this attitude of love, as you view your reality through the lens of love, reality will shift, it will change. Hardships may melt away and new life will be birthed. With your awareness you can ensure blessings come into your reality. With your gratitude, with your love, and with your compassion, you hold the power to create positive change in your life for earth and for all beings. Now is the time, you are the one, this very moment is the moment. Embody an attitude of gratitude, of love, and of awareness, and this, my friend, is your next step. This is your path to integrating more light, more blessings, and more well being. Give thanks in joy and shine your light. I, Archangel Michael, leave you with my blessing, with love, with compassion, and with gratitude. And so it is and so it shall be. Goodbye for now. I hope you enjoy this free angel message and I look forward to sharing more with you in the days to come. P.S. Need help shifting out of fear amidst a crisis or mounting challenges? Wow this is such an amazing gift from light I chose the card of letting go of fear.This card brought me to the angle message of Arcangel M it is the most powerful reading that was given to me.in now momments it clears up all of what to do with it and rejoice in the most important information given to me in the perfect now time.Thank you Iam truly blessed to know moving forward is what I must do and have the knowledge of words that guide me moving full force in gratitude Thank you namaste . This resonated so beautifully with me this morning. I recently left a church because it no longer served me. I planned on continuing friendships with those in the church I loved and with whom I had become dear friends. When those friendships slowly fell away, one by one, I gave thanks for the many ways they had enriched my life, and released those dear people into the light. I will always love them and will be overjoyed to run into them and share a moment as our souls recognize each other, but in releasing them, I felt I had opened my life for new abundance, adventures, and new friends. There is no regret — I will always cherish this time in my life, and know that from it, came only love and understanding. Thanks so much for all you do for so many. You are loved. ThankYou give me the understanding. Archangel Michael help me with understand. To able to carry on.